Hello and welcome to All Pro Dads (APD), an exciting alliance of dads and dad-like positive influencers of our great students throughout the Cedar Hill ISD. 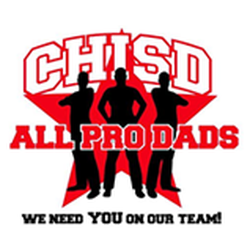 CHISD All Pro Dads is an opportunity for male role models to connect with other men who are committed to the success of their child or children. These men not only positively influence their sons or daughters but their presence directly impacts other students as well. Each CHISD campus has a chapter with its own unique identity that reflects the interests and needs of their school. However, CHISD All Pro Dads is unique in that we also network together as a single group across the entire district. One group, 13 chapters, all working together! While we are still building our framework for APDs and have incredible plans in the future, there are several simple things we do to make our presence visible throughout the campuses. A few simple opportunities include helping during drop-offs for the smaller kids, attending athletic events, and making sure our older students feel safe with caring dads in close sight. Each campus has multiple volunteer opportunities such as hosting Family Math and Literacy Nights, Family Fun Nights, and Open Houses. In addition, we also invite you to join committees such as the PTA, which provides invaluable input regarding the programs and school improvement strategies at your child's campus. Joining APD is simple. Just let us know who you are by providing your contact information. Your chapter leader will contact you with additional details and planned chapter or district events. T-shirts are also available to further identify you as an All Pro Dad. Your willingness to be a part of this unique and quality organization is a statement of the commitment and dedication it takes to make our school district one of the best in the country. Thank you again for being a part of All Pro Dads and as always….. It’s a Great Day to be a Longhorn!! This is a documentary video produced by the Family First, All Pro Dad Organization and narrated by Tony Dungy. It highlights the tremendous growth and development of the CHISD All Pro Dads.